This is a review of HR23+ Hair Restoration Tablets. It is claimed this product prevents hair from falling out in both men and women, preventing baldness. This product is also promoted as a safe and healthy way to treat hair loss in the beginning stages. To learn more about HR23+ keep reading here to find out about the ingredients and effects. The active ingredients in HR23+ are the vitamins E, B2, B1, B6, B12, C, MSM and Saw Palmetto. Vitamin E improves blood circulation which helps hair to grow. Vitamins B2, B1, B6, and B12 help the body deal with stress, which can cause hair loss, prevent the loss of hair, and promote hair growth. MSM helps grow hair more rapidly, and Saw Palmetto aids in preventing hair loss. The recommended dosage for HR23+ is one tablet taken twice each day with water and food. It is not recommended for woman who are pregnant or breast feeding, or anyone who is taking medication, unless directed to by their physician. The website showed HR23+ to have no reported side effects. After researching, no complaints of adverse side effects were found. It should be noted taking the supplement without food may cause stomach upset. If you are allergic to any of the ingredients do not take this product. Signs of an allergic reaction are dizziness, trouble breathing, or vomiting, if any of these occur discontinue use and see your physician. The website shows the price in pounds, upon conversion into American money, the price is $77.50 plus shipping and handling costs. There are discounts when purchasing multiple bottles. The website showed no guarantee for HR23+ except for a low price guarantee. After researching, there was no option to return the product if dissatisfied. 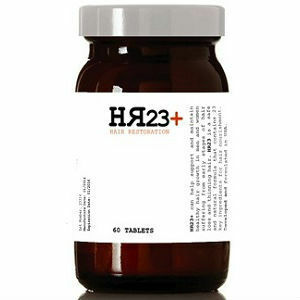 HR23+ Restoration tablets consist of many ingredients known to aid in the battle of hair loss and the re-growth of hair. The vitamins and nutrients this product contains can aid in the overall health of the consumer, hair can become healthier as well as nails and skin. It should be noted this product is formulated to help people in the beginning stages of hair loss, it has not been proven to help those who have had massive hair loss already. Reviews from customers on the website were positive with many recommendations for the use of HR23+. In addition to the supplement there is a serum for hair growth available, it is recommended to use both the serum and the supplement together to have maximum benefits. The cost of this product is on the high side when compared to similar products. There is no guarantee for this product. Research did not find where the product is made. John Brownstone	reviewed HR23+ Hair Restoration	on August 3rd	 and gave it a rating of 2.5.